Haryana Chief Minister Manohar Lal Khattar on Wednesday addressed India News Haryana event Shaurya Samman, held in Chandigarh. Speaking at the event, Manohar Lal Khattar said that he was ready to face early assembly elections in the state if that was the case. He also honoured Haryana Police bravehearts for their outstanding service. Haryana Chief Minister Manohar Lal Khattar on Wednesday attended India News Haryana Shaurya Samman programme, organised to honour Haryana Police personnel for their outstanding service. Addressing the event, Chief Minister Manohar Lal Khattar spoke on various issues including his government’s performance, on One-Nation-One-Election issue, on having early assembly elections in Haryana, his forward vision for the state and other issues. Speaking candidly on the recently held meeting of all BJP-ruled states chief ministers with Prime Minister Narendra Modi, Manohar Lal Khattar said that it’s a routine process to conduct a meeting of all BJP-ruled states chief ministers to discuss the performance of their respective governments, the issues which they are facing and planning the roadmap for future. He shared that in the recently held meeting, they did talk about 2019 Lok Sabha elections. Haryana Chief Minister also shared that recently a Memorandum of Understanding (MoU) has been signed by chief ministers of six states on Lakhwar dam and its biggest beneficiary is going to be Haryana. Further sharing his thoughts at the event, Manohar Lal Khattar said that in the coming years, there will be more women police officers in the state. Speaking about the performance of his government in its so far tenure and if assembly elections are held before the scheduled time, Manohar Lal Khattar said that they are ready if that is going to be the case. On One-Nation-One-Election proposal, Haryana Chief Minister said that PM Modi is in support for conducting simultaneous elections but a consensus is required to make an amendment in the constitution. He said that all the political parties have to be on board on the issue of having simultaneous elections in the country. 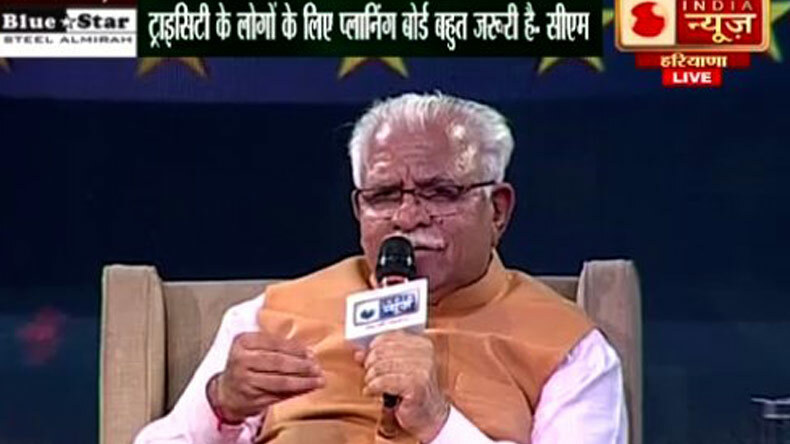 On being asked to which state Chandigarh belongs to, CM Khattar said that at the current scenario, Chandigarh belongs to both Haryana and Punjab, however, a decision should have been taken when Haryana was carved out of Punjab. Manohar Lal Khattar also shared his vision of forming a tri-city planning board for Chandigarh, Panchkula, Mohali to monitor and execute development plans in these three cities for better accountability.